If you're planning your visit to the Barbican, you can find full information about the access provisions for each of our venues including access routes, seating arrangements, assistance dogs, captioning and hearing loops. 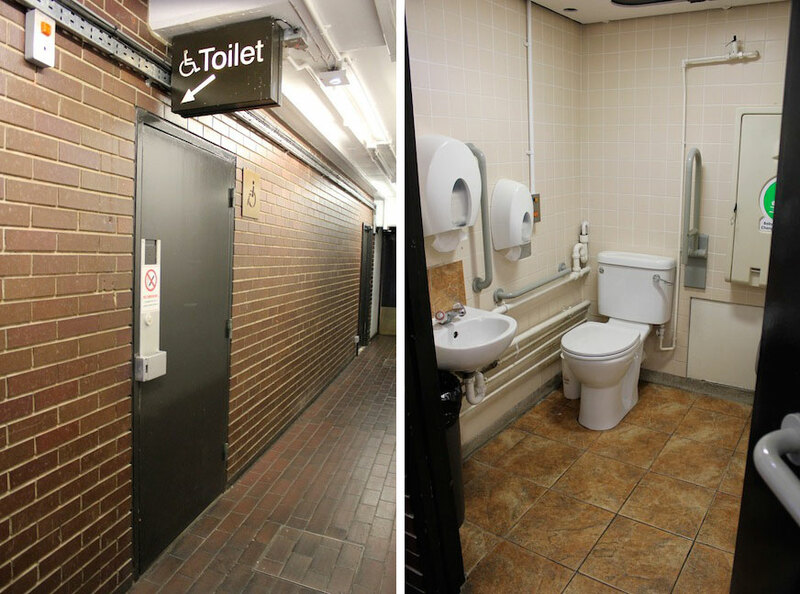 A Changing Places facility is located within the Beech Street Cinema complex for the exclusive use of severely disabled people who need personal assistance to use the toilet. The facility includes a height adjustable bench, tracking hoist system, a centrally placed toilet, a height adjustable basin and a shower. The facility is open 8am–10:30pm Monday–Friday and 10am–10:30pm at weekends and public holidays. The following is a list of accessible toilets available at the Barbican Centre (Silk Street) and Beech Street cinemas. Many of the toilets have double door entry (some single door) with automated push panel open and close controls and with a swipe lock and unlock door mechanism. Some doors are not automated requiring them to be opened, closed and locked manually. On the links below, you'll find full details and photographs of each accessible toilet and the facilities available in each room. Priority is given to disabled people using these toilets. Nearest for Auditorium 1, Auditorium 2 and Frobisher Rooms. Right hand transfer. Size 160cm x 132cm. In this small toilet, some wheelchair users may find difficulty turning. Nearest for Art Gallery, Conservatory, Sculpture Court. Left hand transfer. Size 197cm x 167cm. Nearest for Library. Right hand transfer. Size 150cm x 173cm. In this small toilet, some wheelchair users may find difficulty turning. Nearest for balcony of the Concert Hall. Right hand transfer. Size 252cm x 144cm. Nearest for Doors 6, 7 & 8 of the Hall. Left hand transfer. Size 224cm x 142cm. Nearest for Concert Hall, Ground floor foyer, The Curve. Right and left hand transfer. Size 218cm x 202cm. Nearest for Cinema 1 and Pit Theatre. Right hand transfer. Size 152cm x 237cm. Two toilets, available during Theatre performances only. Reached by a lift (93cm x 166cm). Right and left hand transfer. Size 150cm x 162cm. Right and left hand transfer. Sizes vary (minimum dimensions 140cm x 170cm). Three toilets. Level access. Both right and left-hand transfer. Sizes vary (minimum dimensions 180 x 185cm). The Barbican Centre is signposted on all main roads into the City. The car parks are off Silk Street and off Beech Street (westbound access only). There is a headroom restriction of 1.85m. All car parks stay open until midnight. The easiest access into the Barbican is from Car Park 3 or Car Park 5, both of which have blue badge parking bays. An accessible ramped entrance into level G foyer from Car Park 5 is available. If you are an occasional visitor to the Centre, please take your blue badge to one of our box offices or reception desks on the day of your visit in order to receive a complimentary car park voucher. Car Park 3 and Car Park 5 provide flat access into the Centre on levels minus 1 and G respectively. There are 7 accessible bays in Car Park 3 and 6 accessible bays in Car Park 5. These are the two most accessible car parks. Blue badge holders may reserve a wide parking bay in Car Park 3 or Car Park 5, subject to availability. Bookings can be made between 10am and 8pm Monday to Saturday (11-8pm on Sunday) on 020 7638 8891. Your vehicle registration number and the date and time of your booking will appear on the display stand notice located at your reserved parking bay. The number of accessible parking bays available at the Barbican Centre is limited, so please remember to cancel your booking should you no longer require it. View images of the entrance and accessible bays in Car Park 3 and Car Park 5.